Muted autoplay is still allowed. So script can set the “muted” attribute on HTMLMediaElement to true, and autoplay will work. We expect to roll out audible autoplay blocking enabled by default, in Firefox 66, scheduled for general release on 19 March 2019. In Firefox for Android, this will replace the existing block autoplay implementation with the same behavior we’ll be using in Firefox on desktop. There are some sites on which users want audible autoplay audio and video to be allowed. When Firefox for Desktop blocks autoplay audio or video, an icon appears in the URL bar. Users can click on the icon to access the site information panel, where they can change the “Autoplay sound” permission for that site from the default setting of “Block” to “Allow”. Firefox will then allow that site to autoplay audibly. This allows users to easily curate their own whitelist of sites that they trust to autoplay audibly. 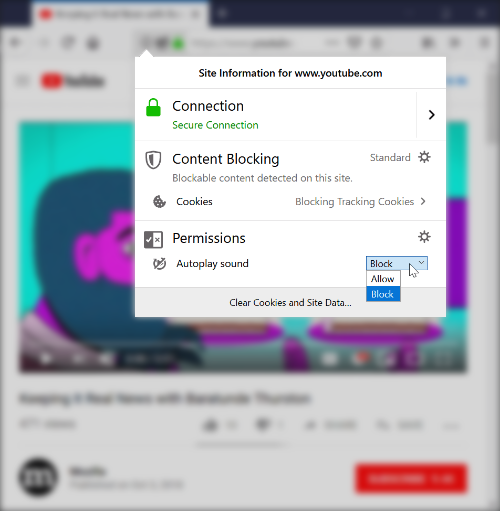 In Firefox for Desktop, users can click on the “autoplay blocked” icon in the URL bar to access UI where they can grant a site permission to autoplay audibly. If you want to avoid having your audible playback blocked, you should only play media inside a click or keyboard event handler, or on mobile in a touchend event. Another strategy to consider for video is to autoplay muted, and present an “unmute” button to your users. Note that muted autoplay is also currently allowed by default in all major browsers which block autoplay media. We are also allowing sites to autoplay audibly if the user has previously granted them camera/microphone permission, so that sites which have explicit user permission to run WebRTC should continue to work as they do today. At this time, we’re also working on blocking autoplay for Web Audio content, but have not yet finalized our implementation. We expect to ship with autoplay Web Audio content blocking enabled by default sometime in 2019. We’ll let you know! The post Firefox 66 to block automatically playing audible video and audio appeared first on Mozilla Hacks – the Web developer blog.